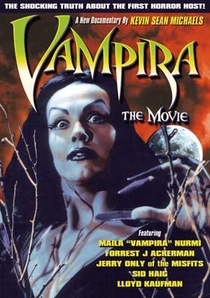 The new documentary by Kevin Sean Michaels Vampira: The Movie chronicles the life of Maila Nurmi, the first horror host. In 1954 her big break came when she played the "glamour ghoul" Vampira, who weekly wandered through a hallway of mist and cobwebs to greet her weekly viewers of obscure horror movies on a new medium called television. Her newfound fame led her to pal around with some of Hollywood's elite: Marlon Brando, James Dean and Anthony Perkins. But Vampira's show was abruptly cancelled. Two years later, in 1956, Nurmi appeared as Vampira again in the 1956 low-budget horror / sci-fi film, Plan 9 From Outer Space, directed by Edward D Wood Jr. (dubbed the worst film of all time). But you can't keep a good vampire down and Nurmi's character rose from the dead again in 1993's Ed Wood, directed by Tim Burton and starring Johnny Depp. The movie renewed interest in her and she has achieved a Bettie Page-like cult status ever since.